David Shribman is the Pulitzer Prize-winning editor of the Pittsburgh Post-Gazette and a former writer for The Buffalo News. Cynthia Skrzycki is a former reporter who is now a senior lecturer in the English Department of the University of Pittsburgh. Together, they presented the Fitzpatrick Lecture at Canisius. 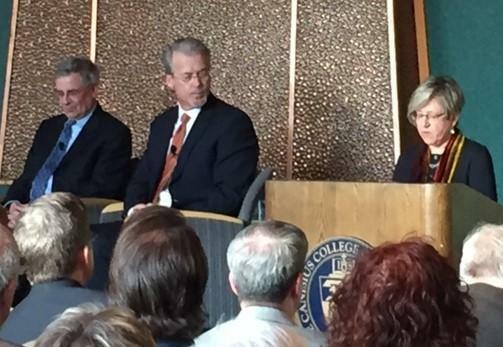 David Shribman (left) and Cynthia Skrzycki (right) speak at Canisius College about the dilemma of fake news. Shribman also was a longtime reporter for The Wall Street Journal, a publication well-known for a disconnect between its news reporting and Opinion pages. Shribman said he avoids that issue in his current position. "On my first day, I took a vow of chastity, not only not to join the Editorial Board, which my predecessor presided over, not to be present at the deliberations, but also not ever to read the editorials in the paper," Scribman said. "So I know less about my newspaper than someone who pays $2 for it, but I'm not guided by what the official position of the paper is." Skrzycki said the biggest problem in the news world today is social media, where almost anything is posted. She said Facebook has been rethinking how to deal with what is posted, in the wake of the presidential election campaign and what happened with a lot of fake news posted. However, it is not always easy to know the difference. "Find facts. Verify facts. All that kind of thing. I think you have to tell people that it's up to you what you are going to read," Skrycki said. "And I understand that makes it very difficult when the President of the United State is saying everything is fake news, but I think the media has done a pretty good job of explaining what fake news is, really is, as opposed to what the president thinks it is."